A biblical covenant is an agreement found in the Bible "between God and his people in which God makes certain promises and requires certain behavior from his people in return." It is the customary word used to translate the Hebrew word berith (ברית, Tiberian Hebrew bərîṯ, Standard Hebrew bərit) as it is used in the Tanakh 135 times (see appended list), thus it is important to all Abrahamic religions. The equivalent word in the Septuagint and the Greek New Testament is διαθήκη/diatheke (Strong's G1242). The foundation of the Torah is the belief that God chose the children of Israel, in his wisdom and for his purposes, and made his covenant with them. This covenant requires the children of Israel not to practice idolatry and to live their lives according to the commandments. (Lev 26) This covenant is essentially one-sided, since its terms are dictated by God, though performance is left to the free will of each person. By contrast, at many points in the Hebrew Scripture, human covenants are made, and in such covenants, the terms are agreed upon mutually. And in the twenty-eighth jubilee [1324-1372 A.M.] Noah began to enjoin upon his sons' sons the ordinances and commandments, and all the judgments that he knew, and he exhorted his sons to observe righteousness, and to cover the shame of their flesh, and to bless their Creator, and honour father and mother, and love their neighbour, and guard their souls from fornication and uncleanness and all iniquity. For owing to these three things came the flood upon the earth ... For whoso sheddeth man's blood, and whoso eateth the blood of any flesh, shall all be destroyed from the earth. 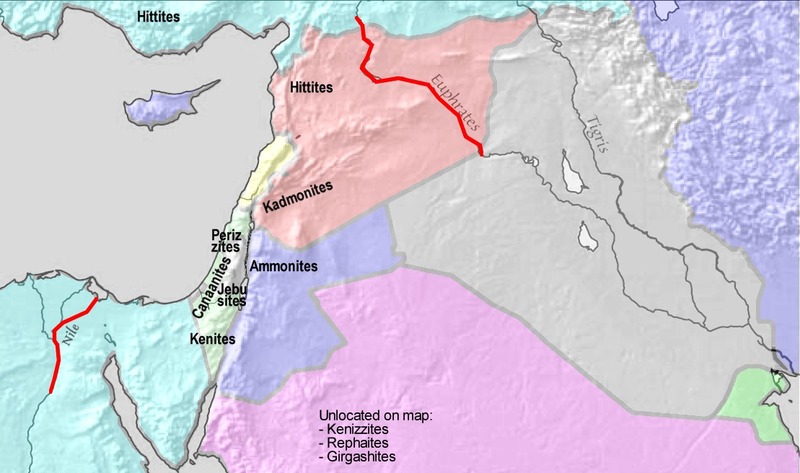 An interpretation of the borders of the Promised Land, based on God's promise to Abraham (Genesis 15). The Abrahamic covenant, found in Genesis 12-17, is known as the Brit bein HaBetarim, the "Covenant Between the Parts" in Hebrew, and is a commandment for Brit milah in Judaism. The covenant was restated for the descendants of his son Isaac found in Genesis 17:2-9 and Deuteronomy 1:7-8. To give Abraham's descendants all the land from the river (or wadi) of Egypt to the Euphrates. [15:18-21] Wadi means seasonal river in reference to the Nile Delta which flooded seasonally during those days. Later, this land came to be referred to as the Promised Land or the Land of Israel, however the land specified by the Abrahamic Covenant also includes the modern nations of Saudi Arabia, Omen, Yemen, Turkey, Iraq, Syria, Lebanon, Jordan, Kuwait, UAE, and several other nations within the Middle East Region. The Abrahamic Covenant of Isaac did not pass to all the descendents of Isaac, however. From Isaac the Covenant passed to Jacob  and from Jacob the Covenant passed to Joseph [48:3-4]and then to his son Ephraim [48:17-19] so that while it was prophesied that the Messiah would come from Jacob's descendent Judah a.k.a. the Jewish people the birthright of many nations remained with Joseph's son Ephraim. [5:1-2] However the Ephraimites were defeated by the Assyrians in 556 BCE and systematically disbursed throughout the Assyrian Empire (which included parts of the modern nations of Saudi Arabia, Egypt, Syria, Iraq, etc.) so that their modern-day identity has been lost. Many groups have attempted to claim this identity, see Ten Lost Tribes, however, most of these groups in America, Britain and Australia do not correspond to the locations specified in the Abrahamic Covenant. To give him and his descendants the land on which he is lying. That his descendants will be like the dust of the earth. That all peoples on earth will be blessed through him and his offspring. The Ten Commandments on a monument on the grounds of the Texas State Capitol. The third non-indented commandment listed is "Remember the Sabbath day, to keep it holy". As part of the terms of this covenant, God gives Moses the Ten Commandments. These will later be elaborated in the rest of the Pentateuch. The fullest account of the Mosaic covenant is given in the book of Deuteronomy, the form of which resembles an Ancient Near Eastern suzerainty treaty. Many Christians believe that the Sermon on the Mount is a form of commentary on the Ten Commandments. See also Biblical law in Christianity. That Israel would lose their identity [7:8]. That while Israel (Ephraim) will become many nations between the Nile and the Euphrates, yet only a remnant of the people of Ephraim will return[10:22]. That Israel and Judah will be at war with each other, but that the Lord would bring about a peace between Israel and Judah. [9:10] [11:14] [30:1-7]. That Ephraim would return to Lebanon and Gilead, which is located in Western Jordan [10:7-10]. However, the only people living in these areas now are the Arab peoples. The Palestinian Refugee camps are also located in these locations. That there would be a conflict between Ephraim and many other nations of the World [33:17] [9:13]. The remnant that will return from Ephraim will be the descendents of those who did not bow to Baal [19:10-18]. That a new nation of Ephraim will form south of Israel in Saudi Arabia or Egypt. A nation the Jewish people will refer to as Sodom [16:46,49]. To regather Israel from its dispersion and unite them with Judah, but that Judah would not recognize them [16:59-63] [33:9]. That a people who are called "Not his people" will be called his people [1:10]. To bring the Israelites to the land which their fathers possessed (here named Land of Canaan) [1:11]. To prosper the Israelites above their fathers. To restore the Israelites spiritually so that Israel will love the Lord with all their heart and soul. To put all the curses of Israel upon Israel's enemies. That the descendants of Judah a.k.a. the Jewish people would return to where their family "Israel" already was [33:7]. National covenants by the nations of Israel and Judah can be found in texts such as Exodus 19:8, Joshua 24:24, 2 Kings 3:3 (Josiah), 2 Chron. 15:8-15, 23:16, 34:31-32, Nehemiah 10:29 and Jeremiah 50:5. National covenants were often associated with times of spiritual renewal or revival. The New Covenant has been a significant feature of Jewish eschatology, as part of the belief that eventually all Jews will know and follow the Torah without the need to study. [Jer 31:32-33] For example, the article Jewish Encyclopedia: New Testament states: "The idea of the new covenant is based chiefly upon Jer 31:31-34 (comp. Heb 8:6-13, 10:16). That the prophet's words do not imply an abrogation of the Law is evidenced by his emphatic declaration of the immutability of the covenant with Israel (Jer 31:35-36; comp. 33:25); he obviously looked for a renewal of the Law through a regeneration of the hearts of the people." It is mentioned several times in the Mishna and Talmud, and had been used extensively in kabbalistic literature due to the Gematria value of 135 (number of occurrences in Tanakh) being equal to the word HaSinai (הסיני) in Gen 10:17. Brit also has the numeric value of 612, which is suggested by some to mean that it is the 'first' mitzvah which is true for the Jewish life cycle. The other use is in relationship to the merit of Ruth being an ancestor to King David, with the name again having same gematria as Brit, linking Davidic covenant with that of all previous, since Ruth was a Moabite by birth, and related to Noah also. In later history, texts such as these have been used to justify political alliances such as that between the Scottish Covenanters and the English Parliamentarians, memorialized in the Solemn League and Covenant. ↑ Christiane Fellbaum (1998). WordNet: An Electronic Lexical Database. Bradford Books. Paul Fiddes (1985). 'Covenant - Old and New', in P. Fiddes, R. Hayden, R. Kidd, K. Clements, and B. Haymes, Bound to love: the covenant basis of Baptist life and mission, pp. 9-23. London: Baptist Union. Truman G. Madsen and Seth Ward (2001). Covenant and Chosenness in Judaism and Mormonism. Fairleigh Dickinson University Press. ISBN 0838639275.